Does your child love aviation? Are you still trying to come up with a Halloween costume? 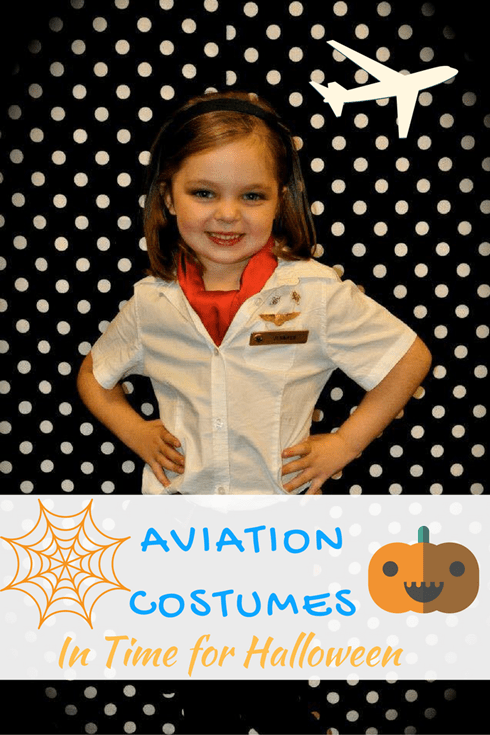 Here are a few ideas for aviation costumes that you can get in time for Halloween! The first one is a DIY costume: a flight attendant! All you need is a white shirt, dark skirt or pants, and the all-important red scarf! If you have a set of the wings the kids sometimes get on flights, add those. If you need wings pins, you can get them here. Or maybe you know a flight attendant who lives nearby who would loan you their wings. 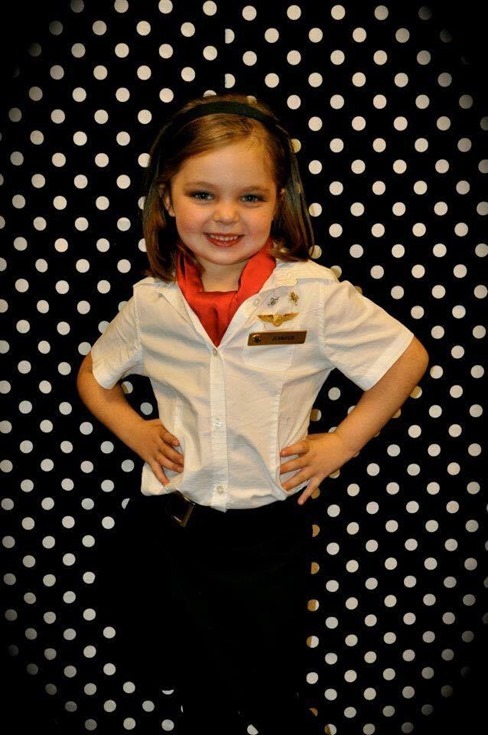 One of my good friends, a former flight attendant, put together this simple and adorable flight attendant costume for her daughter a few years ago. Isn’t she the cutest?! Cute as a button, Carys shows off her DIY Flight Attendant Fashion. Here’s a nice looking pilot! This costume comes with a shirt (with attached tie), pants and Pilot hat. I love this look! What a great aviation costume. This is so cute! I’m going to try to convince my daughter, Ella to try this costume next year. The costume Carys is wearing in the first photo in this post is cuter, but this flight attendant costume is a great alternative if you don’t have the right clothes on hand for a DIY costume. At just $23.95 (limited sizes) this is a good deal. Get this aviator hat for either boys or girls, add a bomber jacket, and you’re good to go! This would be a warm and comfortable costume. Great for kids who don’t like masks or disguises. Maybe your girl wants to be a pilot or your boy wants to be a flight attendant. No problem! Girls: wear a flight attendant uniform and add a pilot hat. Boys: the best way to do a flight attendant costume is don a white dress shirt and dark pants and add a wings pin. Rolling suitcase optional. Will you or have you ever worn an aviation costume for Halloween? We’d love to see pictures! Share on our Facebook wall or tag us on Twitter or Instagram! Tell us in the comments what you’re dressing up as this year. My daughter, Ella (age 8) is going to be a cat and my son, John (age 3) is going to be a mouse.